The most common type of hearing loss is presbycusis, or age-related hearing loss. Diminished hearing is a common side effect of aging, usually coming on gradually and affecting high-pitched sounds most frequently. It occurs as a result of natural changes in the inner ear of an individual over time due to a variety of reasons including constant, cumulative daily noise exposure; hereditary factors; changes in the blood supply to the ear thanks to heart disease, high blood pressure, vascular conditions and circulatory problems; and side effects of some medications. An estimated one third of adults aged 65 or older experience age-related hearing loss; that number jumps to nearly 50 percent by the age of 75. Presbycusis usually affects both ears equally. It may be mild, moderate or severe. Noise-induced hearing loss is the most common type experienced by younger individuals. It can be caused by exposure to a single loud sound, such as a gunshot or explosion, or by continuous exposure to loud noise over a period of time. When sounds exceed 85 decibels (dB) they are considered hazardous to your hearing health. Continuous exposure to volume levels that high causes permanent damage to the hair cells in your ears. Activities that put people at risk for noise-induced hearing loss include hunting, riding a motorcycle, listening to music at high volumes, playing in a band and attending rock concerts. An estimated 15 percent of Americans aged 20 to 69 have hearing loss that may have been caused by noise exposure. This type of hearing loss can be prevented by wearing earplugs and protective devices. Many other factors can contribute to hearing loss, which is divided into three separate categories: conductive hearing loss (associated with problems in the middle ear), sensorineural, or nerve-related, hearing loss (associated with problems in the inner ear) and mixed hearing loss. Presbycusis and noise-induced hearing loss fall into the latter category. 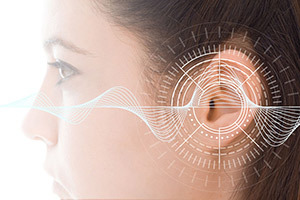 Additional causes of sensorineural hearing loss include head trauma, viruses or disease, malformations of the inner ear, Meniere’s disease, otosclerosis, tumors and heredity. Conductive hearing loss can be caused by ear infections, colds, allergies, impacted earwax, foreign objects in the ear canal, perforated eardrum, poor Eustachian tube function and malformation of the outer ear or middle ear, including the ear canal. Mixed hearing loss is a combination of both. Individuals with this type of hearing loss have damage to their outer or middle ear and their inner ear or auditory nerve.